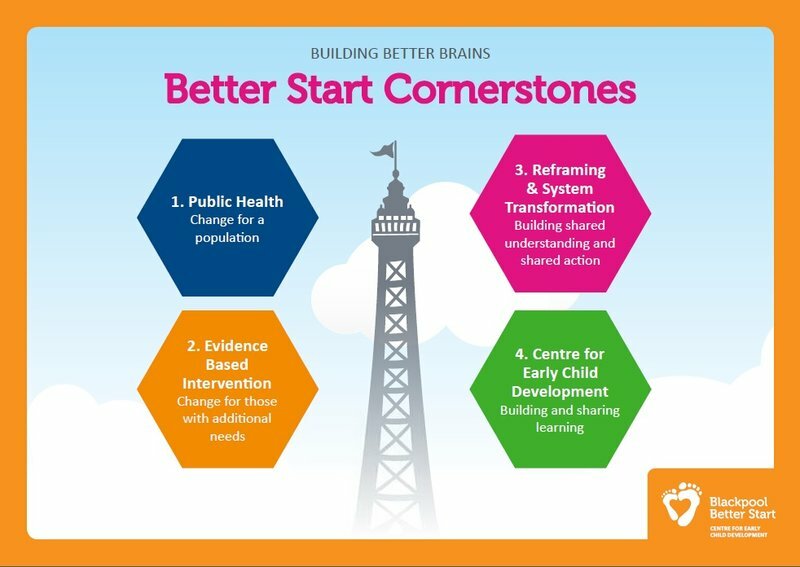 Our first cornerstone in our programme of action is our public health approach, starting with an understanding of the needs of the whole population we will ensure services and messages are available all in Blackpool to address the challenges facing our families. For our second cornerstone we will ensure that those with additional needs have access to a carefully crafted programme of science and evidence- based interventions, designed to provide more intensive services to those families who need them. Our third cornerstone is systems transformation, the change we need to see at all levels of our local services and systems. This will be underpinned by a shared understanding (or ‘framing’) of the problems we face and a cohesive approach that unites community and professionals from all agencies. Our final cornerstone is the Centre for Early Child Development which provides the focus for driving the vision, strategy, programme evaluation, implementation and research.